Please Note: Although the box shows the trigger as silver in color, the trigger is black. A legend of British military arms, the Webley VI first entered service in 1915 and found extensive use in both World Wars as the official sidearm of the British and Commonwealth forces. 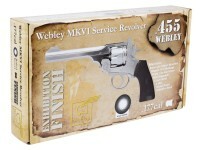 Widely regarded as the definitive edition of the Webley Service Revolver, the Mark VI can now be yours as a CO2 pellet air pistol! 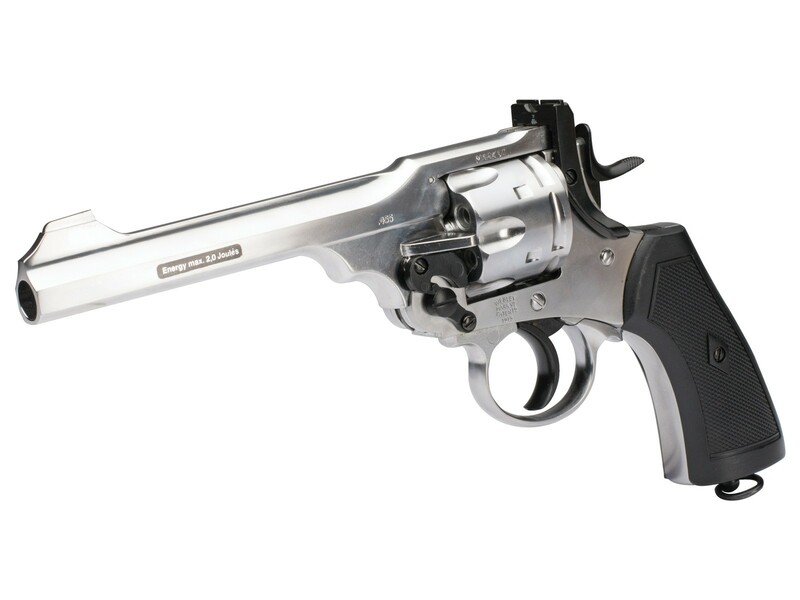 With the Mark VI air pistol, you can enjoy the smooth action and lifelike feel, due to its basis on original Webley blueprints. It loads, cycles, fires, and ejects just like its real-life counterpart, and can even be field-stripped. This variation of this classic pistol features a lustrous, polished silver finish ideal for display. 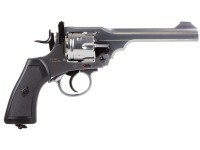 With the Mark VI air pistol, you will own a replica of one of the greatest battle revolvers in history! Things I liked: Beautiful reproduction. Smooth operation. Things I liked: My first reaction was WOW. My second was FABULOUS, really. Exceptional quality, attention to detail, build quality. The Rolex of replica air guns. Things I would have changed: grips could be better. Maybe offer after market grips. What others should know: My gun shoots very accurately with RWS 6.9 grain hollow point pellets. At 11 yards,it shoots them into a ragged hole,about 1/2inch. 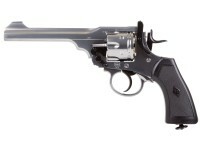 That is off-hand,single action. 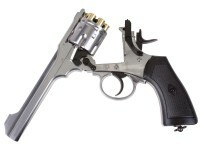 I prefer the single action trigger pull. I even like the sights,the silver front sight contrasting with the black rear sight. 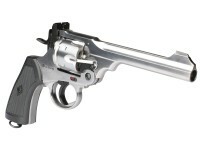 Can you fan this revolver? Is this gun blued or is it chrome? It looks shiny in the photo's.. Don't know if i want it chrome.. Confirming this is a "Rifled" Barrel? I know it list that in the Specs but just confirming.